1) The bulb & the holder type is E-14. 2) Comes with 10 hanging shades. 3) Bulb is not included. 4) As this product is handcrafted there might be a slight color or design variation, which is natural and hence makes the product unique. No doubt, India one of the most beautiful country is often recalled for carrying in their ancient traditions and culture as they were followed years back. This culture-rich country has various ancient artisan and their handicraft products that are still hidden from their original identity and escapes to get their real worth in not only urban but also, in the global market. Thus, here comes ExclusiveLane that is extensively born out of love for handicraft products. 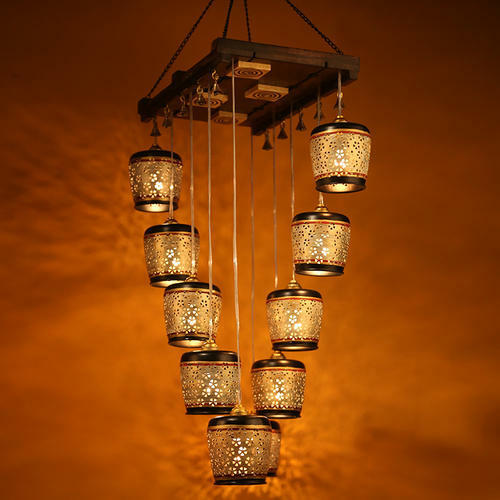 The company is desirous to exclusively handpicked handicraft products from rural artisans from different parts of India and let them to discover their talents through their beautiful handicrafts products. We are termed to exhibit diversity and heritage & authentic products to the urban consumers at an affordable price, preserving traditional art. Customer Serve & Quality – We feel proud to bring to the notice that we lay deep heart service to make our customers serve the very best products from our online store at a reasonable price. Apart, we never compromise with a subject of quality while catering beautiful and unique home decor items. Thus, ExclusiveLane can be recalled to be a one-stop solution for best customer service with prime and exquisite quality of home decor products in comparison to its all close competitors.